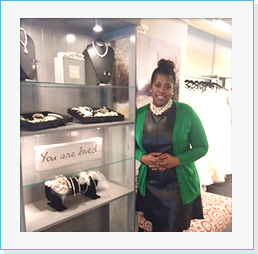 Shannelle Armstrong-Fowler opened Haute & Co.TM Bridal Boutique in Chicago IL, in 2013. Previously before the opening of Haute & Co. Bridal the only option for curvy and plus size brides were big box retailers or unknown online sellers. "I wanted to provide a collection of curvy and plus size wedding dresses created by established luxury designers that would provide fashion-forward, classic and unique options for our brides" Stated by Shannelle. Additionally, she is an award winning communications and retail executive with over 15 years experience. Shannelle writes a weekly blog, Wedding Curves, providing styling, humor and support for brides planning their weddings. UOR: There are a number of challenges that we face as a bridal boutique. However, the largest two are finding the right talent and managing your reputation. They are very interconnect. We can have the most fashion and current style, great location, engaging environment and it call fail with the wrong staff. Brides share word of mouth, Yelp and through social media. We are committed to learning from our mistakes but more committed to not making any. SSS: What advice would you offer a new storeowner? UOR: Find a great accountant! Although we maybe passionate about our business, it is important to be smart as well. Spend a little more money on setting up your business for success in the beginning. It will save you tons of money trying to clean it up down the road. UOR: Digital and social marketing works for our industry. Over 80% of brides start their search online and we need to be there. We have a print partner this year and we will be evaluating their effectiveness more closely moving forward. SSS: What unique things do you do to keep your customer’s happy? UOR: We are luxury wedding gown destination for curvy and plus-size brides. It is important that we demonstrate a high-touch level of service. We have a conceirge service that manages everything from the appointment follow-up to wedding gown preservation. We are committed to removing as much stress as we can from our brides. UOR: The more things change the more they stay the same. We can keep up with all the latest designers, we have the prettiest website, but never forget why you are in business. Stay focused on delivering the best product, service and experience for your customer and you will stay profitable! SSS: What unique things do you do to keep customers’ happy? UOR: We try new products consistently. Our store is ever-changing and evolving and there are always new things to see. We treat every customer like royalty. UOR:To be fair and honest with customers and employees.